Ten-line 67-word Post Office Telegraphs radio telegram, taken down by 'Mayhew', to the Daily Graphic newspaper, London. 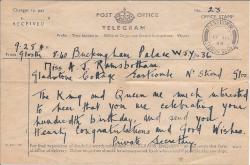 Received at Lands End from the S.S.Lapland, 20 June 1920. Written in pencil by 'Mayhew' on an official printed 'Post Office Telegraphs' form, stamped with telegraph number and dated postmark. Good, on aged high-acidity paper, dimensions roughly 14 x 21.5 cm. Neatly laid down on a piece of brown card. Sent on Pickford and Fairbanks' honeymoon voyage to Europe. The couple have 'received so many lovely messages from friends in England' that Pickford's 'Life Long dream of visiting the old country seems to be all [she] had hoped more [sic] and that saying great deal Douglas is ready to jump from the Top mast the minute we sight Southampton'. 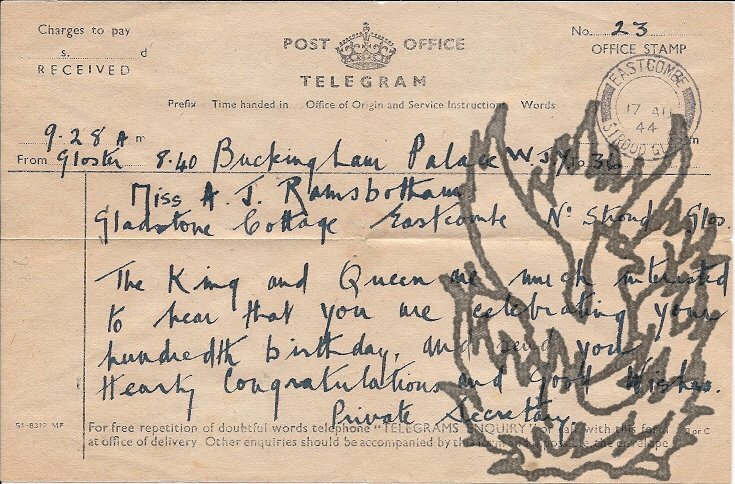 Wireless Telegram to the News Editor, Daily Graphic newspaper, London. A carbon, in the hand of the wireless operator, on an official printed 'Post Office Telegraphs' form ('FOREIGN AND COLONIAL TELEGRAMS ONLY'). Good, on aged high-acidity paper, dimensions roughly 12.5 x 19 cm. Neatly laid down on a piece of brown card. Sent on Pickford and Fairbanks' honeymoon voyage to Europe.